Taylor Trammell does not have any MLB stats for the season. Draft: 2016, Cincinnati Reds, CBAth rd. Last name is pronounced truh-MELL...in 2019 participated in his first Major League spring training camp...entered the 2019 season rated by MLB Pipeline the second-best prospect in the organization, behind IF Nick Senzel, and by Baseball America the third-best prospect in the Reds' system...entered 2019 rated 33rd on Baseball America's Top 100 Prospects list...in each of the last 3 seasons was an MiLB.com Reds Organization All-Star...in 2018 was the Most Valuable Player of the Sirius XM All-Star Futures Game, a mid-and post-season Midwest League All-Star and an Arizona Fall League Rising Star...in 2017 was a Baseball America Class A All-Star...in 2016 was rated the best athlete and fastest base runner in the organization...in November 2016 participated in a leadership training program at West Point. Graduated from Mount Paran Christian School in Kennesaw, Georgia, where in his senior year he combined for 8 Player of the Week awards and 7 Player of the Year awards in football and baseball...was the Georgia Sports Writers Association's Class A Offensive Player of the Year after he rushed for 2,479 yards and 36 touchdowns on 251 carries and collected 144 receiving yards and 2 touchdowns on 17 catches...during his senior baseball season hit .463 with 6 HR, 19 RBI, 30 runs scored and 22 stolen bases...with a 3.4 GPA, was a Wendy's Heisman Student Athlete All-American...received the Ron Mulkey Eagle Award, Mount Paran's most coveted and prestigious honor given to servant-leaders who "honor God, love others and walk in truth"...participated in the Under Armour All-America Game at Wrigley Field...his brother, Kyle, was a starting linebacker at Mercer University...participated in the 2019 Reds Caravan...follow on Twitter @TayTram24. At Class A Daytona Beach was the Most Valuable Player of the Sirius XM All-Star Futures Game, an MiLB.com Reds Organization All-Star, a mid-season and post-season Midwest League All-Star and an Arizona Fall League Rising Star...as MVP of the Futures Game at Nationals Park sent his bat to the Cooperstown Hall of Fame...went 2-for-2 with a 438-foot HR and a triple...among Florida State League leaders ranked T3rd in runs scored and walks, fourth in on-base percentage, T4th in stolen bases and ninth in hitting...with 25 steals ranked third among all Reds minor league batters...was voted by Baseball America the Futures Game's best hitter and the Florida State League outfielder with the best throwing arm...was rated by Baseball America the fifth-best prospect in the Florida State League and by MLB.com the seventh-best prospect in the Arizona Fall League...following the season played for the Scottsdale Scorpions in the Arizona Fall League (22g, .298, 4 2b, 2 3b, 0 HR, 6 RBI, 6 SB, .359obp, .393slg, .752ops). 2017: At Class A Dayton was a Baseball America Class A All-Star...ranked among Midwest League leaders in games (1st), RBI (2nd), walks (2nd), stolen bases (2nd), hits (3rd), triples (3rd), total bases (4th) and batting average (10th)...reached base safely in 28 straight games from 6/28-7/28 and in 27 consecutive games from 4/8-5/11...was rated by MLB.com and Baseball America the Reds' third-best prospect...following the season was rated the sixth-best prospect in the Midwest League...2016: Was rated by Baseball America (5th) and MLB.com (11th) among top prospects in the organization...was rated by Baseball America the organization's best athlete and fastest base runner...his 24 stolen bases ranked T3rd in the Pioneer League. 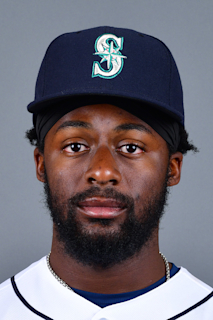 April 2, 2019 CF Taylor Trammell assigned to Chattanooga Lookouts from Daytona Tortugas. January 9, 2019 Cincinnati Reds invited non-roster CF Taylor Trammell to spring training. April 4, 2018 CF Taylor Trammell assigned to Daytona Tortugas from Dayton Dragons. March 1, 2018 OF Taylor Trammell assigned to Cincinnati Reds. April 5, 2017 LF Taylor Trammell assigned to Dayton Dragons from Louisville Bats. March 29, 2017 LF Taylor Trammell assigned to Louisville Bats from Billings Mustangs. March 11, 2017 LF Taylor Trammell assigned to Cincinnati Reds. June 16, 2016 LF Taylor Trammell assigned to Billings Mustangs. June 14, 2016 Cincinnati Reds signed OF Taylor Trammell.